Unique spray booth ideal for the model builder or designer. 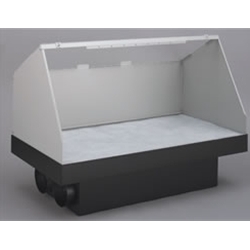 The 15" x 30" (38 x 76 cm) spray booth (accommodates objects up to 28" long and 13" wide) is ideal for reducing the over spray and odors from aerosol or airbrush painting. The 1530 offers a three-stage filter system: a replaceable pre-filter sheet, which captures the bulk of the sprayed materials, thick polyester mid-filter and a polyester/carbon filter. The built in exhaust adapter can be outfitted for venting out-of-doors. The 1530 features a metal hood with a clear window for excellent illumination and a perforated front edge for hanging small parts.